Officers said a person tried to rob Smoke Shop on Western Branch Boulevard. An employee with a gun followed him out of the store and took a shot. Police say all three suspects are still at large. CHESAPEAKE, Va. (WVEC) — Police in Chesapeake say they have arrested three suspects who allegedly robbed a smoke shop in Chesapeake last week, and were confronted by an armed employee. 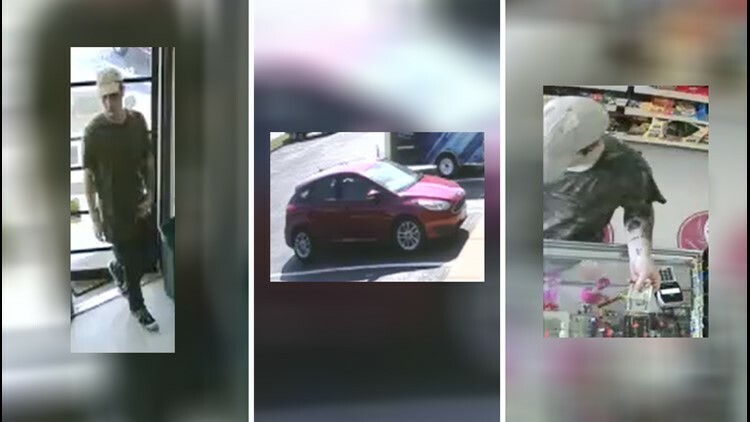 Investigators say that on the morning of July 17, four people pulled up to Smoke Shop in the 3100 block of Western Branch Boulevard in a red car. One of the people got out of the car with his face covered, armed with a gun. He then went into the store and grabbed some merchandise. As the suspect ran out and got back into the car, a store employee with a gun followed behind and took a shot at the car as it left. "Only one shot was fired. He walked with a mask covering his face the entire time down-like he wasn't even trying to hide what he was about to go do,” said Josh Smith, who works at the neighboring business. Police don't know if the bullet hit the car or anyone inside it. Investigators say they have identified and since arrested three of the suspects. The robbery is still under investigation. Police ask that if you have any information about this robbery, to call the Crime Line at 1-888-LOCK-U-UP.